One set contains: Student Math Journals (Volumes 1 & 2) - These consumable books provide daily support for classroom instruction. They provide a long-term record of each student’s mathematical development. 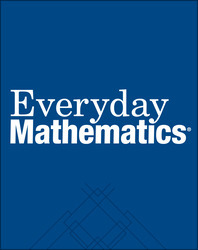 Student Reference Book (Grades 5) - This book contains explanations of key mathematical content, along with directions to the Everyday Mathematics games. Geometry Template - A component of the Student Materials Sets in Grades 4-6, this is a multi-faceted drawing/measuring device that features 23 geometric shapes.